Dr. Alan Bernstein is the President & CEO of CIFAR, a Canadian based global organization that brings together some of the world’s preeminent researchers to address questions of importance to the world. Dr. Bernstein received the AAAS James Loudon Gold Medal in Mathematics and Physics from the University of Toronto in 1968, his Ph.D. from the University of Toronto (1972), and then did postdoctoral work at the Imperial Cancer Research Fund Laboratories in London (UK) where he did some of the earliest work on oncogenes. In 1974, Dr. Bernstein joined the Ontario Cancer Institute and the University of Toronto. In 1985, he was appointed to the Samuel Lunenfeld Research Institute in Toronto, serving as Director of Research from 1994-2000. 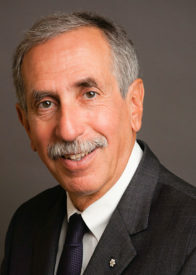 Dr. Bernstein served as the founding president of CIHR (Canadian Institutes of Health Research), where he led the transformation of health research in Canada (2000 – 2007). He then served as executive director of the Global HIV Vaccine Enterprise (2008 – 2011), an international alliance of funders charged with accelerating the development of an HIV vaccine. Dr. Bernstein’s contributions to science have been recognized with many awards and honorary degrees. He has served on advisory and review boards for governments, foundations and research institutions in Canada, Australia, the United States, Portugal, South Africa, China, Italy and the UK. He is a Senior Fellow of Massey College and Distinguished Fellow of the Munk School of Global Affairs and Public Policy. In 2002, he was named an Officer of the Order of Canada and in 2015, he was inducted into the Canadian Medical Hall of Fame.